This thing was built out of old computer cases. The bottom half is a Klee sequencer. 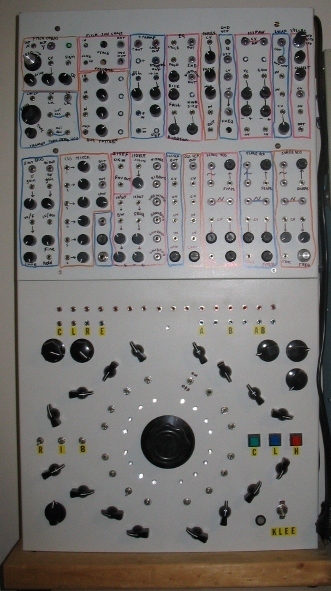 Originally the intention was to have no labelling on the modules, except for black rings around the outputs. Two weeks later i got out the artlines and wrote names on everything, so it looks like crap. But it has the Klee, three early Serge VCOs, two thru-zero VCOs, a Serge vari-BW VCF, a few chaos modules and a bunch of other 'essential' modules. So it is a good synth and cost well under $100 to build.